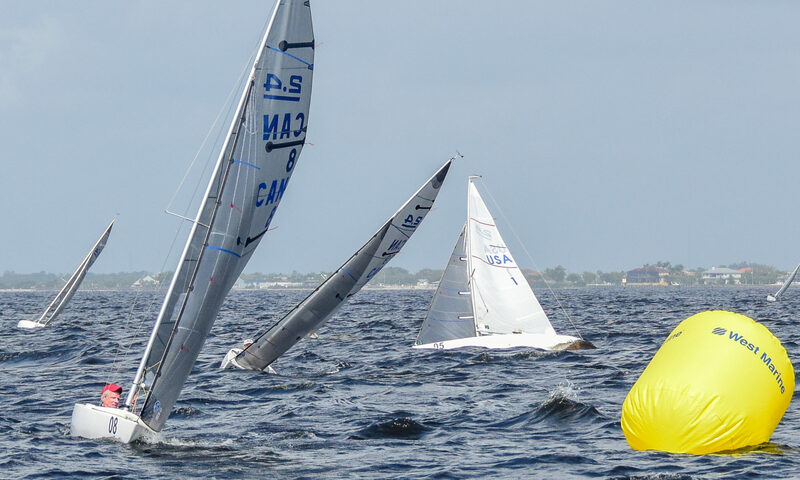 The Victoria fleet hosted the class Pacific Coast Championship on June 16-17. The event attracted two competitors from out of town: Wendy Frazier, Calgary, and Jeff Reinhold, Seattle, to make an eleven boat fleet. Unfortunately, our Saskatchewan friends were unable to attend. We delayed our practice session on Friday afternoon by an hour awaiting the flood tide to return enough water under the jetty to launch the visiting 2.4s. Friday morning was a ten-year record low tide! On Saturday morning the SE wind was very weak and turbulent for the initial race, switching to the N by the last leg. Boats could make big gains on one leg and experience a significant lose on the next leg. It mixed the fleet quite successfully. Ones view of the race depended on one’s final finish position. After a short postponement, the wind settled into a 4-8 kt southerly at the mouth of Cadboro Bay with enough shifts and pressure changes to reward those with their eyes on the water. By Race 4 the flood current set in gently at the weather mark and it had enough strength that it caught some by surprise. Trying to shoot around the mark was risky; the result was two competitors demonstrated their skills at 360-turns. We completed five races by 3.30. 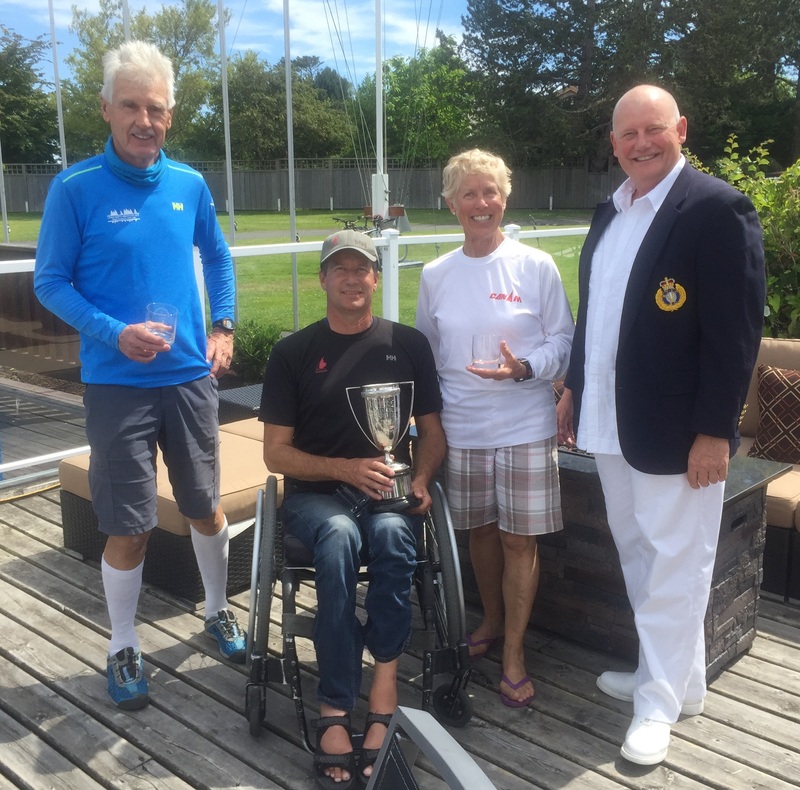 After putting away the boats, we retired to the patio for refreshments and contemplated the close results – ties between four pairs of competitors. Sunday dawned sunny and clear. The Caddy Bay summer northerly showed its first zephyrs by 9 am and built to 4-6 kt by race time. The RC set up a short course, maybe 300 m long, from the RVYC breakwater to the beach. Early in the day, the pressure and lifts favoured the right side of the course. In the latter races, lifts on the left side of the course were dominant. However, all day competitors needed to watch their compass for shifts, watch the water for puffs and be prepared to revise their plan to be successful. Thank you to the race committee: John Edwards (PRO), Ron Jewula (ARO), the crew from Kairos and many others. Besides running nine races, they found time to serve bbq’d hotdogs between races on Saturday and fresh baked brownies on Sunday. What a team!! Check out the Hotdog Drive Thru in Rod Mack’s video . See the deluxe ‘dog’ he collects when he eventually gets in the queue. Award winners: 1st Bruce Millar, 2nd Louise Anstey, 3rd Doug Bell. See full results here. Award winners from left: Doug Bell (3rd), Bruce Millar (1st), Louise Anstey (2nd), AJ Hesford, RVYC Racing Fleet Capt.